"Ethel" premiered on HBO on Oct. 18. TAMPA, Fla. -- The University of South Florida College of Arts and Sciences is giving away two free VIP passes to “An Evening with Rory Kennedy.” The passes include access to a reception with food and drinks, and reserved seats at the film screening. 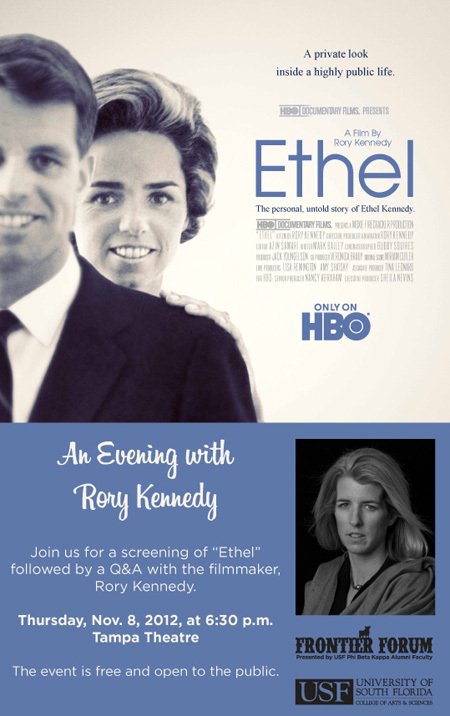 Rory Kennedy, the niece of President John F. Kennedy, will be showing her documentary "Ethel" at the beautiful Tampa Theatre in downtown Tampa at 6:30 p.m. on Thursday, Nov. 8, 2012. To enter the contest, think of your favorite family tradition and write a description between 50 and 200 words. This tradition could be a yearly trip, a holiday festivity or special family ritual. To be eligible, you must like the College of Arts and Sciences’ Facebook page. Submit a photo of your family tradition along with the description on our website. Your family tradition and photo must be submitted by Tuesday, Nov. 6 prior to 5 p.m. The best answer will be chosen and the winner may claim their two VIP passes on Wednesday, Nov. 7. This event is part of the Frontier Forum lecture series, presented by the USF Phi Beta Kappa Alumni Faculty and sponsored by the USF Office of the Provost, USF College of Arts and Sciences and Mayor Bob Buckhorn.